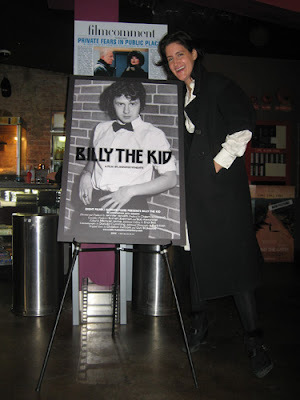 Billy The Kid: Thank You NYC and the IFC! 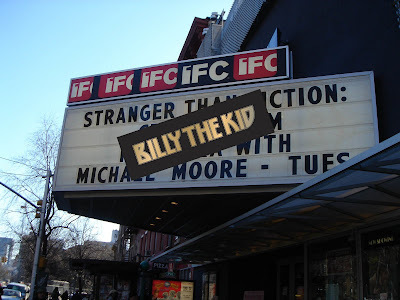 We would like to thank everyone for supporting Billy The Kid at the IFC. Billy Loves NYC and NYC Loves Billy!! This film was heartbreaking and beautiful. 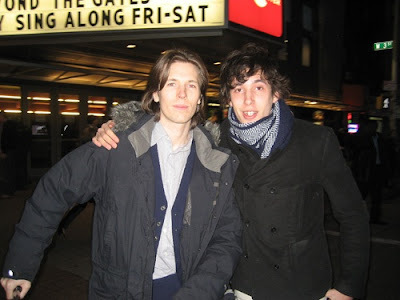 I was so geniunely moved to see someone from my same town on the screen, I attended this screening just knowing it was in Maine - I had no idea the opening shot would be the street I grew up on, the high school i graduated only two years ahead of him, the dojo i took karate at. I saw Billy - in terrible pain, asking you to leave his room after his girlfriend broke up with him, and the camera remaining steadfast inside his small trailer shack room... Only slowly backing out, having to be shut out, still looking for a glimpse of a face, anything - a probing unnerving lense, which for the first time I noticed, was not focused so intently for the purpose of art, but embolstered by only one cause, the power of opportunity. The Q & A left me more disturbed, the coldness of your personality and new york generalities abound.. 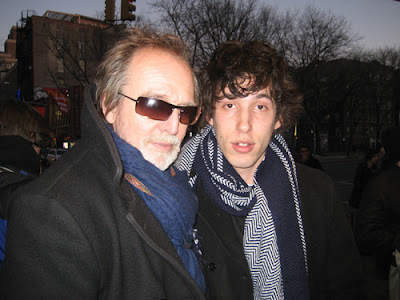 The sense that the concern you expressed for Billy's very real disease, aspergers (a disease my own brother grew up with and struggled with all his life in a small town in maine) seemed almost recited and rehearsed, seemed tired as one could only expect and sympathize from such a long run on "the festival circuit". I'd imagine it's hard to make such a speech seem geniune after so many recitals. It seemed to me, that in the end of it all, when wandering through the hallway reception at IFC, picking up slickly designed posters and bumper stickers that exclaimed, "I'd rather be a girl's slave than her master" (something billy had awkwardly admitted to you in the film) seeing the a-list actors who showed up to the premiere, I realized in a rush of sadness that what I thought had been a celebration of a human being and individual I had felt so intimately attatched to, by age, by family, by history of abuse.. had only been a tremendous gift from one person himself, Billy. I was inevitably captivated by the tortured individual that Billy had allowed you to see, and vastly disturbed by the subsequent branding tailored exclusively for the new york elite. It is sad to me, to see how the city can change what should be so true, how careerism and thirst for fame can clout what this could mean.. This film will be at its greatest when it ends up where it belongs, screening at small filmhouses twenty years from now without any real names attached to it, a simple stroke of luck and gift of geniune beauty from someone and something that New York City will never be able to understand short of pointing a camera at it. Near the end of your question and answers you described that "Billy has seen the film and is in support of what it's all about".. As a fellow mainer, teenager, and person who understands the effects of aspergers, at least some one can stand up for him and only hope that you appreciate the fact that another human being had let you in so close, that aside from all these future film plans, ambition, the new york city hype, that you recognize with whatever capacity you can, that this human being has given you so much.. things that you will not be able to understand for years and years until the prospect of opportunity has lost interest and meaning and form to you..
and I only sincerely hope for his sake he never knows the opportunity for the film career he unsuccessfully launched. You can't make a film career off of someone elses soul. I guess things do move faster in maine..
if you disagree so strongly.. you can email me, but I can't shake this bad feeling.. The movie is amazing. I had watched it once at home and was excited and delighted to see it again on the big screen. It's really a beautiful and inspiring portrait. I wish more things were treated so simply and directly. I loved how it didn't over explain everything, or even try to. I find so often that storytellers/directors assume that the audience needs every little detail explained. they spend half the time building back-story and context, when a truly well told narrative can exist without any of that. With your film, you assume your audience is smart, creative, thoughtful and patient enough to get past all the obvious narrative trappings and appreciate the subtle (or in Billy's case not so subtle) qualities of life. It is a generous method, so thank You. what is your next film project? If you ever need a still photographer let me know, I would love to help out. consume me at this time in my life. And how charming is he!? So sweet and intelligent and sensitive and funny! He is such a unique soul and I absolutely adore him. Thank you so much Jennifer for making this movie. Thank you Billy for being you. 1) What was your reaction to the movie overall? My reaction to the movie was MOVING!!! 2) Please describe the movie in one or two sentences. This movie allowed me to see how a challenged kid can be smarter than many of us so well adjusted folks. 3) What about the film do you find marketable or appealing to the public? What was marketable and appealing to me and a couple people that I spoke to was that we saw ourselves in Billy. To me he said things that I have thought of but never had the courage to say out loud because of the critical eye of society. Billy had no filters and spoke from his heart. That is very rare today. 4) What theme or story line do you find to be the “hook” and would intrigue people to see the film? I'm not black, not white, not foreign, just different in the mind. 5) Do you feel like you need an explanation at the end for where Billy is now? Do you want to know whether or not he has a condition and if so what it is? At first I did but then taking a page from Billy's book, the imaginative world is sometimes better than the real world, I would say no. I was wondering what disorder he has, but does it really matter? This kid needs no labels. I was interested to know if his step dad was moved enough to go back home and try and make it work. I feel that would be a great chapter in Billy's life. Thank you for a moving, deep, truthful, straight-shooting and entertaining film. Good luck with future projects.